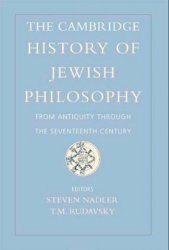 The first volume in this comprehensive work is an exploration of the history of Jewish philosophy from its beginnings in antiquity to the early modern period, with a particular emphasis on medieval Jewish thought. Unlike most histories, encyclopedias, guides, or companions of Jewish philosophy, this volume is organized by philosophical topic rather than by chronology or individual figures. There are sections on logic and language; natural philosophy; epistemology, philosophy of mind, and psychology; metaphysics and philosophical theology; and practical philosophy. There are also chapters on the intellectual background of Jewish philosophy, including Islamic and Greek thought and the Jewish philosophical textual traditions. With essays by leading scholars in the field, this volume provides the reader with a wonderful overview of the richness and sophistication of Jewish philosophy in its golden age.